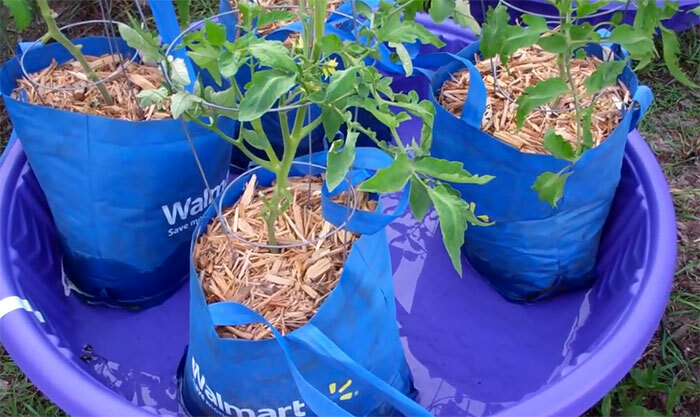 How would you like to grow a garden in bags – inside a kiddie pool? It sounds a little weird, but that’s exactly what Larry Hall of Brainerd, MN did, and it works incredibly well. Larry first experimented with growing vegetables in bags that were each set up in their own individual plastic tote for sub-irrigation watering. 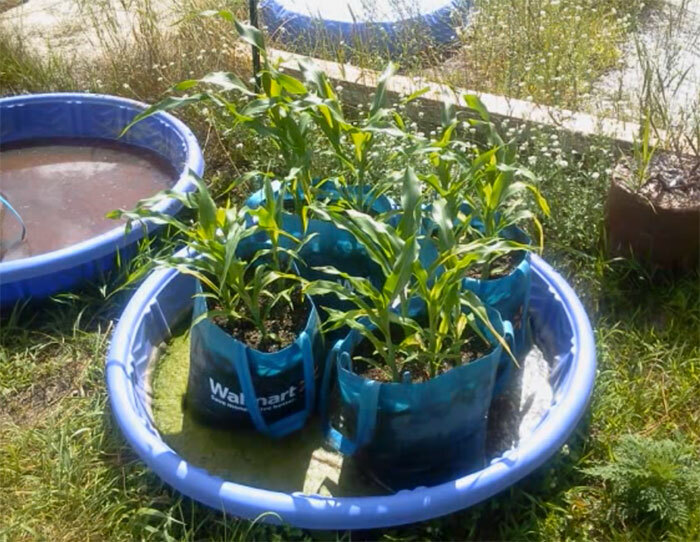 After seeing kiddie pools on sale, he decided to try using those as the water containers, allowing him to grow several bags of plants together. 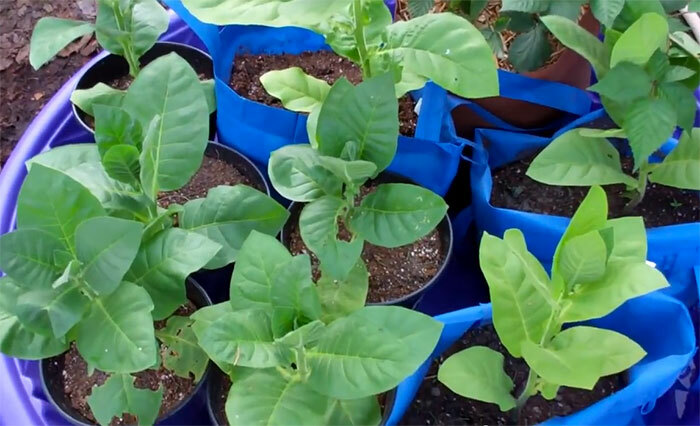 And rather than spending money on expensive grow bags, he bought several of the cheap reusable shopping bags from Walmart and also made some out of landscaping fabric. 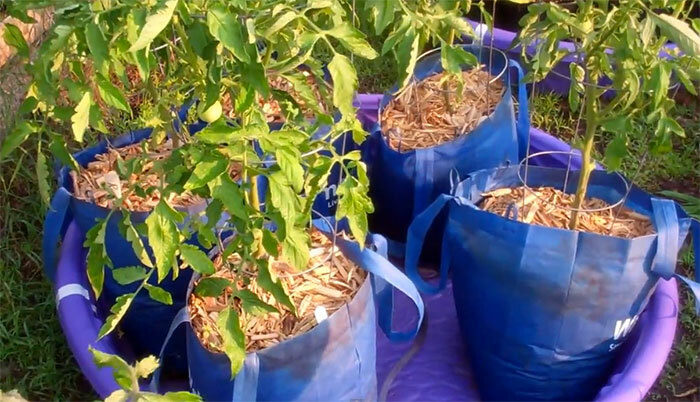 These bags absorb water very well, which is why they are so effective for this type of gardening. There are several benefits to growing a garden in a setup such as this. First, the water is contained, so it is used more efficiently than the water used for plants that are grown right in the ground or in grow beds, which can create plenty of water waste and runoff. A small amount of water is all that is needed to keep the bottoms of these bags moist. Larry suggests that this system is especially good for growing tomatoes, as watering from the bottom prevents many common tomato diseases. In areas that get plenty of rainfall, water would rarely have to be added to the pool. You wouldn’t want the water to get too high, however, so Larry suggests drilling some overflow holes or installing a float in the pool to keep the water level fairly low. 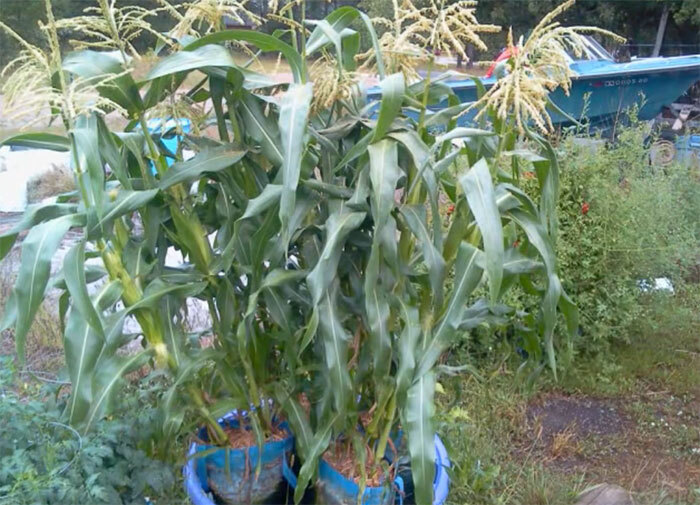 He achieved phenomenal results with this system, growing tomatoes, tobacco, corn, and blackberries. The above picture shows the progress with the tomatoes after only a couple weeks. Below, the corn at the end of the season is over 8 feet tall – well above the estimated plant height given by the seed producer. 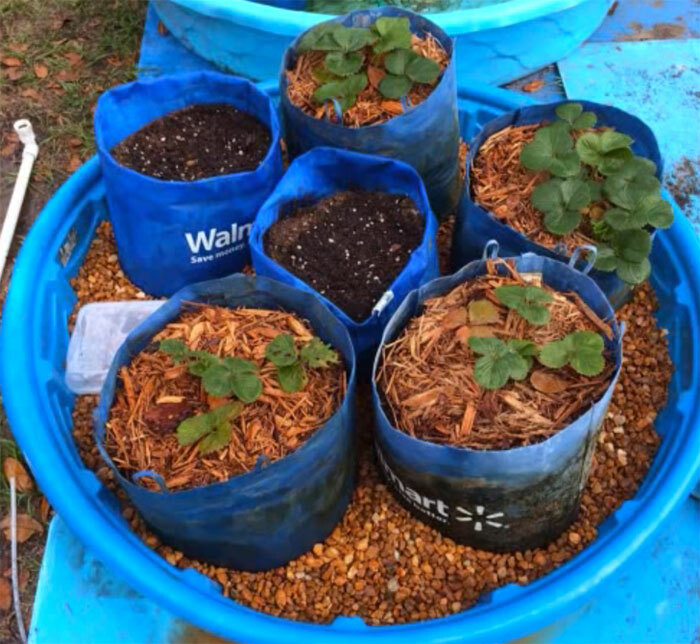 After one season of growing using this method, Larry noticed that algae became a problem, and many people had concerns about the potential for mosquitos to use the pools as a breeding ground. Mosquitos can be avoided by letting the water dry out every few days or by using drop-in insecticides that are safe for garden plants. But these concerns promted him to come up with a hybrid kiddie pool solution, using a float and pea gravel to make something that has no standing water for mosquitos and is more asthetically-pleasing. Hi! Someone in my Myspace group shared this website with us so I came to look it over. I’m definitely enjoying the information. I’m book-marking and will be tweeting this to my followers! Superb blog and great design and style. Great idea, especially the last pictures showing the pool bottom covered with pea gravel to keep skeeters from breeding!